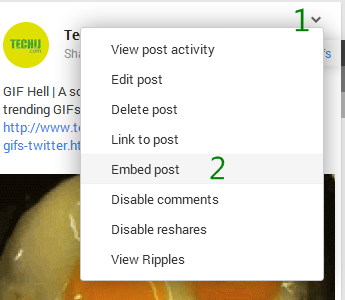 After facebook Now Google also released a new feature to embed Google plus posts in to blog post. So, from now you can integrate any publicly available Google plus post directly into your blog / website in order to share it with your friends. Then copy the second code (marked in green as 4 in screenshot) and paste it in your blog post text wherever you want to show Google plus post. Checkout below GIF post which I have embedded via Techij Google plus page.